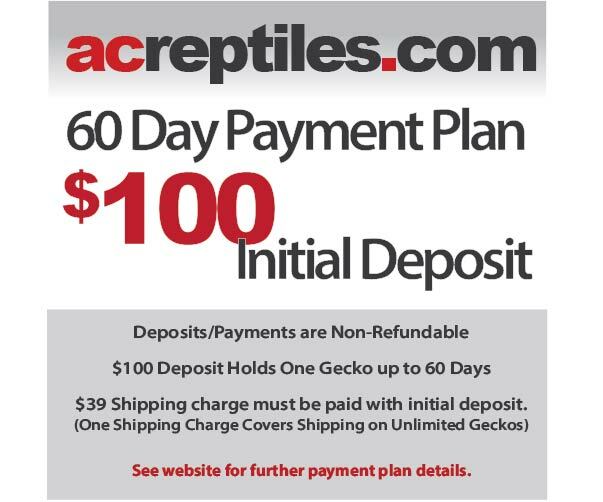 We are now offering payment plans with a non-refundable $100 deposit for individually listed geckos up to $1,000 in value. An additional deposit may be required for geckos over $1,000. We DO NOT offer payment plans on auction geckos - those must always be paid for within 48 hours. Can I purchase multiple geckos on payment plan? Yes. On purchases of multiple geckos, one deposit of $100 is required for each gecko, but only one shipping charge is required. Our flat rate $39 shipping charge covers an unlimited number of geckos for just $39. Once the balance is paid in full, shipping is scheduled and then your geckos are shipped via FedEx Priority Overnight. We can offer these plans without prior approval, but the catch is that all payment plans must be adhered to exactly as agreed upon and completed within 60 days. Payments made, both the deposit and installments, are non-refundable. Please understand that those with uncompleted payment plan agreements will not be due any refunds or store credit, regardless of the reason given. Furthermore, we are unable to let people switch to a different gecko after a deposit has been made and that gecko has been taken off the website. The only way we’re able to offer payment plans is if we're absolutely certain that a particular animal is spoken for. Please make sure that you understand that any and all payments cannot be refunded or applied to the purchase of other geckos. By completing this purchase you are agreeing to the terms above. Add this down payment item to your cart by clicking the ADD TO CART button above, select $39 SYR shipping option and then complete checkout. Your total will be $139. DO NOT ADD THE GECKO TO YOUR CART. Message us on Facebook or email john@acreptiles.com to let us know which gecko you would like by sending us the geckos item Code (shown below the Available Add On Options), the page link or the Title/Description Line. We will add your selected gecko to your payment plan order after it is in our system, and the gecko will be taken off the website and held for you. If you would like to make a larger down payment, you can message us and we will send you a link. When you are ready to make another payment, email John and he will send you a link for the amount that you will be paying.